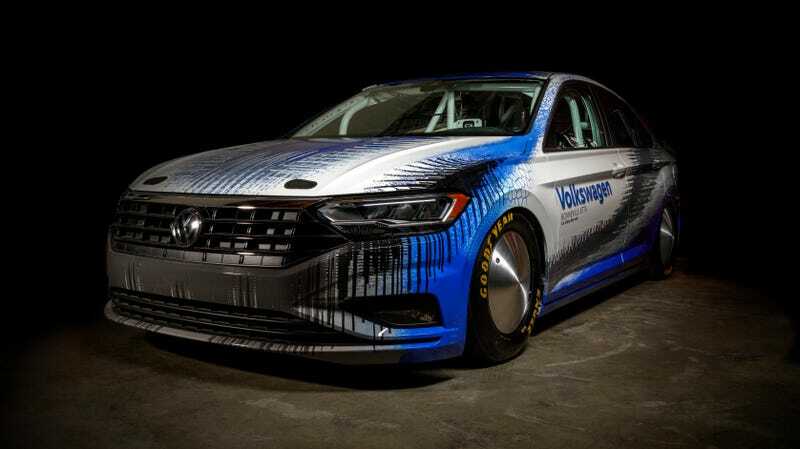 A couple of months ago Volkswagen announced that it would be bringing a new Jetta sedan to Bonneville Speed Week to contest the 2-liter Blown Gas Coupe category record. That record currently stands at 208.472 MPH, and Volkswagen seemed reasonably confident that they could come home with that record in their name. Bonneville doesn’t have many manufacturer-supported efforts on the list of record holders, dominated largely by privateers and small independent hop up shops. Perhaps there is a reason for that. When I arrived to Bonneville on Friday afternoon I did a cursory cruise of the paddock to see what the next couple of days held for me. I was on the lookout for the interesting and noteworthy, ticking mental boxes on a list of things I’d told myself to keep an eye out for. Interestingly, I didn’t see the ostentatious blue and white Jetta that legend had foretold. I was looking forward to seeing what Volkswagen could do, and held out hope that I’d see the car perhaps the next day. When Sunday morning came and there was still no Volkswagen, I asked around as to what could have happened. The registration trailer said Volkswagen wasn’t on the official roster, but told me to seek out a man who goes by Kiwi Steve, and that perhaps he would have more information for me. Steve has some kind of insider information as he’s in the scrutineering department. Once I’d tracked him down—I was told he wears a big hat—he confirmed simply that Volkswagen wasn’t here. We had a silly transmission issue on the first dyno run and while it got fixed, it meant we were behind on the program. Instead of making the team work 18 hour days, we decided to give this one a miss and go back in September. The September Bonneville World Of Speed event is usually a smaller event with far less fanfare. Run by the Utah Salt Flats Racing Association instead of the Southern California Timing Association, the event doesn’t tend to attract the big names, and likewise rarely results in a new record having been broken. Since I was curious as to what happened to Volkswagen’s effort, we figured you might be similarly interested. Now you know.